In studying the power of the blood, we find that from the very first, God had it in his plan that blood would be that efficacious agent for the sins of man. From this verse, we learn that the blood of innocent animals was shed in order to cover the shame and sin of man. This, undoubtedly, was a decree from God because we read in the very next chapter that Abel offered a blood sacrifice to God. Cain in his arrogance and pride thought that his sacrifice of the fruit of the ground would suffice, but this was not in God’s plan. Consequently, his offering was unacceptable to God. As we read from Genesis to Malachi, the theme of a blood atonement is prominently portrayed. Under the Old Testament economy, the blood of animals merely rolled the punishment of the people’s sins ahead for one year; it never completely absolved their sins. This is why God sent his only-begotten Son to die on Calvary’s cross, so that through his death, we might all receive life. It is evident from these, and many more verses, that we can now enjoy a right relationship with God. We need no longer to be estranged from our Heavenly Father. This is called the doctrine of Justification. It means that we become justified in the eyes of God because Christ’s innocent blood was shed for our sins. We can receive this justification by asking Jesus to come into our hearts and allowing him to become the Lord of our life. This is the first step in having victory in your Christian walk. Upon becoming Christians, we experience a new birth. God, in his mercy, declares us to be righteous because of the shed blood of his Son. Although the Blood takes away all our previous sins, we still retain that sin nature or sin principle within our being. This is where the Cross comes into view. The Blood deals with the sins of man, whereas, the Cross deals with the sinner or sin nature of man. It is because of that act of love on Calvary that we can live a victorious life in this sinful world. Instead of the cross being a symbol of defeat, Jesus caused it to be a sign of victory. It forever will remind Satan that Jesus redeemed mankind through his sacrifice on the cross. Too many times Christians are robbed of this victory because they do not recognize their adversary. Those Christians who do not acknowledge demonic spirits have arbitrarily forfeited that segment of the gospel of deliverance. By denying the activity of demons in today’s society, these same Christians betray their ignorance of many significant portions of Scripture. The Bible speaks of man as being a tri-partite creature. That is, man is composed of body, soul, and spirit. The body is evidently that fleshly part. The soul can be referred to as the mind or emotions of man. The spirit is that eternal part that was fashioned after the likeness of God. Satan will try to take control of any or all parts of man, so that he may destroy him. One way that Satan tries to steal our victory is by bringing our sins before us and making us feel guilty. This is why the Bible refers to him as the Accuser of the brethren. Another way the tempter comes to us is through our thoughts. Oftentimes, we entertain thoughts or ideas that are not pure or wholesome. There must be a conscious resistance to these alien thoughts if we are to have victory. Satan will also try to rob us of our peace of mind and our sanity. But this too has been purchased for us as a result of Calvary. If he can saturate our minds with thoughts of fear, jealousy, envy, lust or some other unwholesome thought, then he has stolen our victory from us. The way we combat this maneuver of Satan is to first of all recognize who originated these thoughts. Obviously, these thoughts do not come from God, but are of Satanic origin. We know from Scripture that it is the will of God for every Christian to have peace of mind and in complete control of his sanity. Anything that would breed turmoil or confusion is the work of Satan and should not be tolerated by a child of God. It is clearly seen that this peace of mind rightfully belongs to every Christian. But this victory will not be ours if we stand idly by. Here, the Apostle Paul declares how he can stay alienated from the sins of this world, namely, in the Cross of Jesus Christ. The Father looks at the provision at Calvary, and the sinner becomes sanctified and cleansed. Since Jesus has already paid the price and won the victory over Satan, it is the Father’s will that we, too, should claim this same victory. In order to do this we must daily put our trust in the Cross of Christ. This is the second step to victory . The Spirit is probably the most neglected power that God has given to man. It is the most neglected because it is the least understood. Christians have a head knowledge that the Spirit of the Risen Christ indwells their heart, but that knowledge very seldom becomes a vibrant reality. It is like a mighty river that has been dammed up and the flood gates never opened to unleash its unfathomable power. If we could really comprehend that God’s Spirit actually merges into our own human spirit to guide, strengthen, and teach, then we would be spared many unnecessary heartaches. The Spirit is that still, small voice which acts as the Believer’s conscience. Sometimes you may feel a warmth or a good feeling about a certain situation. If you have asked God’s direction, then, this is probably the Holy Spirit speaking to your heart. A Christian must be aware of that gentle unction of the Spirit, if they are to mature spiritually. Even though we are Christians, we still have that fallen nature to contend with. That is why God has given us his Spirit to help us in our daily lives. But there must be a conscious effort on the Believer’s part to follow after the leading of the Spirit. Every Christian has resident in their hearts this same Holy Spirit. It is the Spirit of Truth which gives light to the Believer’s walk. Since God dwells within us, then His nature should naturally be expressed through us. This expression of God’s nature will not be realized until there is a suppression of our own fallen nature. This is accomplished by the Christian consistently yielding to the Spirit’s guidance and not to their own selfish desires. Only then can the true fruit of the Spirit become manifest in a Believer’s life. In Acts 1:8, Jesus told the disciples that they would receive “power” after the Holy Spirit would come upon them. The Greek word that is translated power in this verse is the word “dunamis”. We get the word dynamite from this same Greek word. Truly, the power (dynamite) of the Spirit can lead Christians to the third step toward a life of victory. This “confession” is not to be confused with the Catholic doctrine of the confessional. Confession is merely faith’s way of expression. The word translated “confess” comes from a Greek word which means “ to say the same thing ”. Jesus practiced this throughout his ministry. Jesus only said that which he had heard the Father say. Also, I am not referring to the popular, yet erroneous, teaching of the “name it and claim it” segment of Christianity. In studying and listening to the Word of Faith teachers expound on this doctrine, I find that much of it is used to satisfy selfish desires. Some of the televangelists who utilized this errant form of confession actually boasted about their personal jets that they “claimed” (confessed) for their ministry. No, the confession that the Bible teaches is one that edifies, strengthens and encourages the Believer in a closer walk with God. In fact, the very first step that a Christian takes is that of confession . We find this truth in Rom.10:9,10. Therefore, we see that God has ordained confession to be the cornerstone in our justification . Likewise, confession is also the foundation of our sanctification. Not only is confession necessary in maintaining a right vertical relationship (our relationship with God), but confession is critical in keeping our horizontal relationship right (our relationship with our fellow man). Scripture instructs us to “confess your faults one to another” (James 5:16). By sharing our personal shortcomings, others might be encouraged that they are not alone in life’s struggle. Remember, that confession is “saying the same thing”. 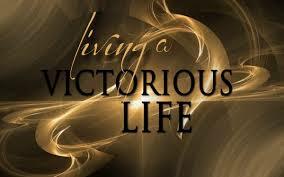 In order to live a life of victory, we must confess those truths and promises that we find in the Word of God. Consequently, this fourth step to victory actually leads us to the fifth step, namely the power of the Word. It has been said that the Bible is God’s love letter to mankind. Certainly we do find in Scripture the unsearchable riches of God’s grace, mercy and love to man. The Bible stands alone of all the books of the world in its uniqueness. It was written over a 1600 year period by over 40 plus authors with all having but one unifying theme. In Eph.6:17, we discover that “the sword of the Spirit, which is the Word of God” is the only offensive weapon in our arsenal against the devil. Remember, that in the temptations of Christ, Jesus used the Word of God in his defense and his offense against Satan. It is no accident that the longest chapter in the Bible, Psalms 119, is totally dedicated to God’s Word. The following are just a few passages that describes the benefits of learning and establishing the Word of God in your hearts. Satan hates the Bible and all it stands for; because in the Scriptures, we find that one day there will be a judgment in which Satan and his hordes will be eternally sentenced to eternal punishment. For this reason, Satan has through the centuries tried to destroy the Word of God. Bernard Ramm said, “A thousand times over, the death knell of the Bible has been sounded, the funeral procession formed, the inscription cut on the tombstone, and committal read. But somehow the corpse never stays put.” Voltaire, the noted French infidel who died in 1778, said that in 100 years from his time Christianity would be swept from existence and passed into history. However, fifty years after the death of Voltaire, the Geneva Bible Society bought his printing press and house, in which, they produced and stored thousands of Bibles. Prayer is how man communicates with God. In the third chapter of Genesis, we find God “walking in the garden in the cool of the day”. Undoubtedly, this was a daily occurrence before the fall. God literally took a stroll with his new creation, Adam and Eve, and communed with them and they with him. Regrettably, sin separates us from God. Prayer is that vehicle in which we can again draw nigh unto God. In the Bible, we find that prayer is absolutely necessary in our walk with God. Notice the urgency of prayer in several of the passages quoted above. As a Christian, we become weak and spiritually anemic when we neglect to pray. Prayer helps build our faith. In the Old Testament, the High Priest burned incense in a censer which symbolized the prayers of the people. We see this same symbolism in the book of Revelation. God has ordained or established praise so that we can become thoroughly complete. By engaging in praise, the Believer becomes strong in order to end or stop the work of the enemy (the devil). Finally, let’s consider the model of prayer that Jesus taught to his disciples. Remember, that this was just a model upon which we should use as a basis of our prayer, and not, just a rote memorization of words to repeat. Noticed that Jesus said, “after this manner”. In this model prayer, we see that it begins with praise and ends with praise . Only after we render praise to God, do we make our supplications or petitions made known to Him. After so doing, we end our prayer with praise . Copyright © 2018 Jim Gibson. All Rights Reserved.